the adventure of renovating a 1907 duplex. the dining room was begging for a special feature. especially since we think that the upper unit originally had one. the picture below is of the dining room before demolition. 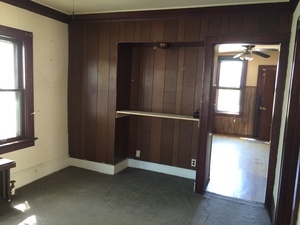 when we removed the wood paneling it look as if a built in cabinet/dining storage area had been removed. after some hunting... at a storage yard near the house and eventually at Waste Cap, we found one! the people at Milwaukee's new waste cap were super helpful. we told them what we were searching for and when one came up that had the measurements/specs we wanted in a home they were working on, they took it out and called us to let us know! however, the hard part was note over. an incredible crew helped with the task of getting it inside. the crew used a ladder to slide it up.